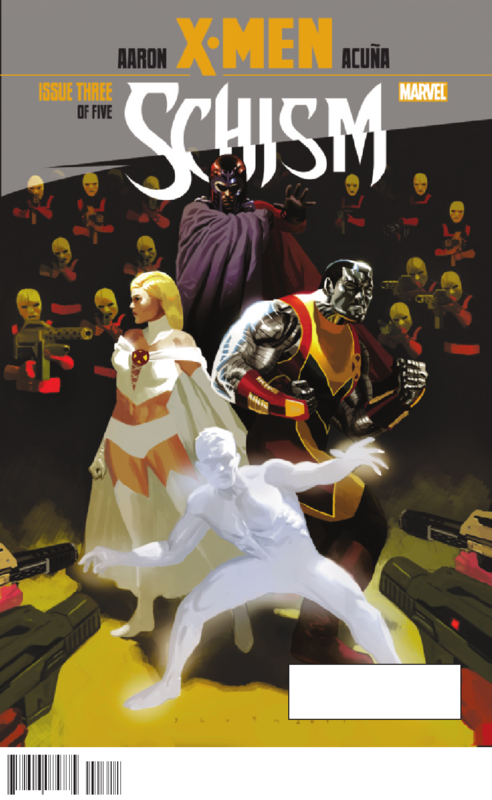 Cover- Emma Frost, Magneto, Colossus and Iceman surrounded by Hellfire agents on all sides, I like it! Art-Daniel Acuna’s art is very different than what we got in X-men Schism #2 but it was a welcome change that added to the intensity of this issue as the stakes were raised high and Acuna’s art helped illustrate and add darkness to the tale. Emotional- My heart literally skipped a beat as the X-men were taken down one by one by the Hellfire club. When Idie saves the X-men tingles traveled up and down my spine. This is the stuff good timeless stories are made of! Threat- This issue we learn just who the supporting cast for our villain are and we also realize why they all seem to be on the same page when it comes to money, power and death. Kade Killgore, Manuel Enduque, Baron Maxamillian Von Katzenelnbogen and Wilhemina; these children are Paris and Kim Kardashian meets joker sprinkled with Sabretooth. Disturbing on every conceivable level! Idie Okonkwo– Finally the pony learns a new trick! Mind you said trick involves killing a bunch of humans who were about to slaughter the X-men but let’s not nitpick this character desperately needed some development! Tension- I honestly got tingles up and down my spine when Scott and Wolverine were both racing to the museum to try and save the X-men while Idie, the sole remaining mutant standing tried to decide what she should do. When they finally arrive and a Sentinel starts forming from the debri of the explosion, $hit just got real! Black Heroes- Idie Okonkwo from Africa and the psychotic Manuel Enduque new member of the hellfire club.